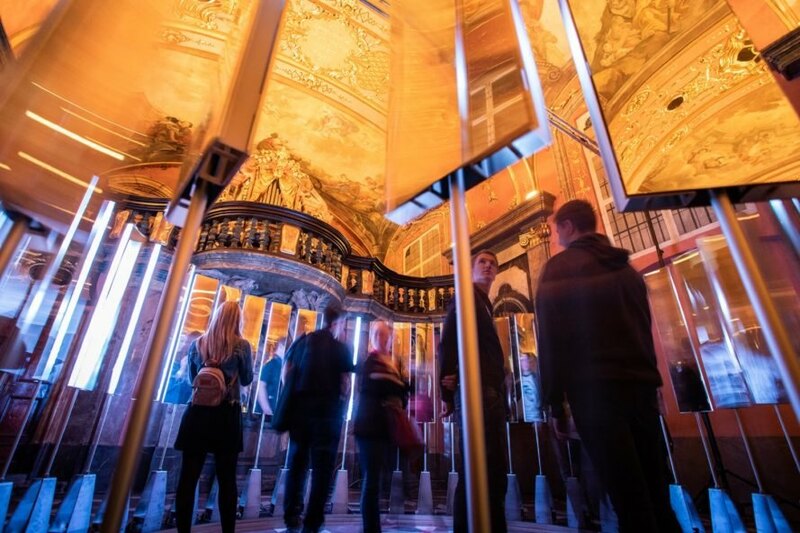 The lavish interiors of Prague, Czech Republic’s Mirror Chapel were recently transformed into a psychedelic art space thanks to New York-based design studio SOFTlab. 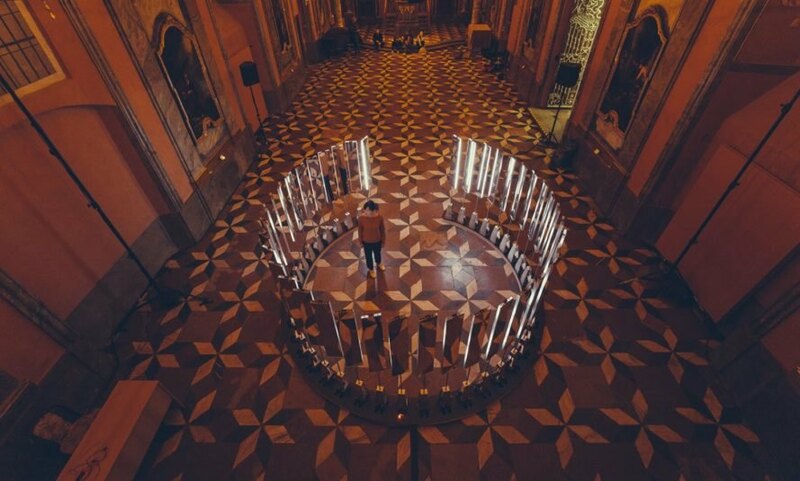 Commissioned by the 2018 Signal Festival that concluded last month, the designers inserted an interactive and circular art installation made of responsive mirrors and LEDs. 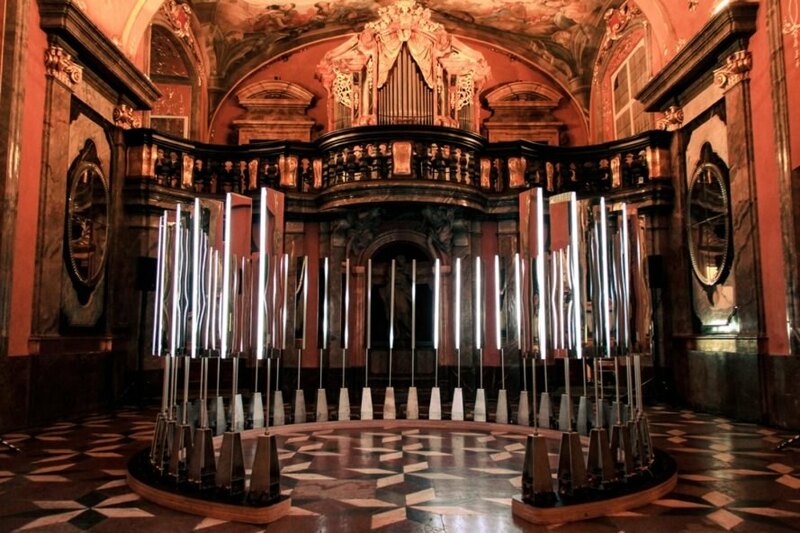 Dubbed Iris, the luminous artwork reacted to ambient sound and the movement of people through the rotation of mirrors, creating vertically fragmented images for a dream-like effect. Built in the early 18th century, the Mirror Chapel has long drawn visitors for its sumptuous interiors dressed with marble, mirrors, gilded stucco decorations and frescoed and painted ceilings. In the 1930s, the beautiful chapel — which belongs to the historic complex of buildings in Prague called Clementinum — began being used for secular purposes such as concerts and exhibitions. 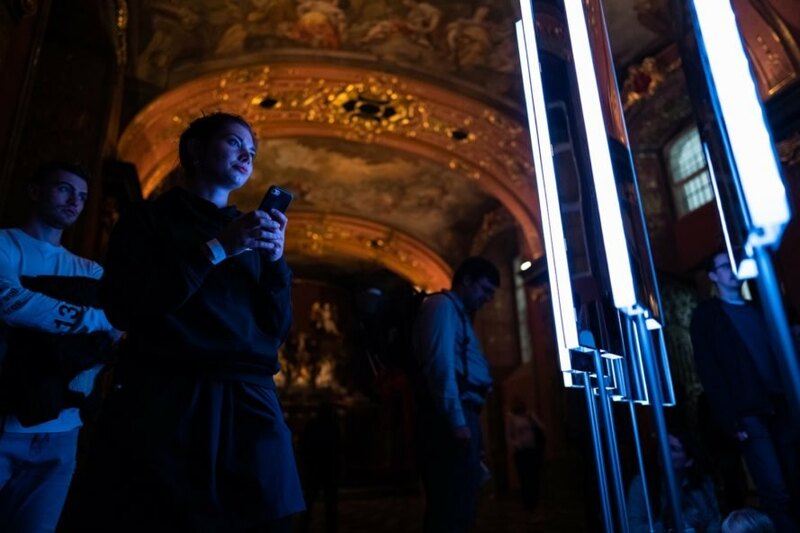 The building has also been a popular destination for the Signal Festival of Lights, the largest cultural event in the Czech Republic that unites art, urban space and modern technology and has drawn crowds of more than two million people since it was launched five years ago. 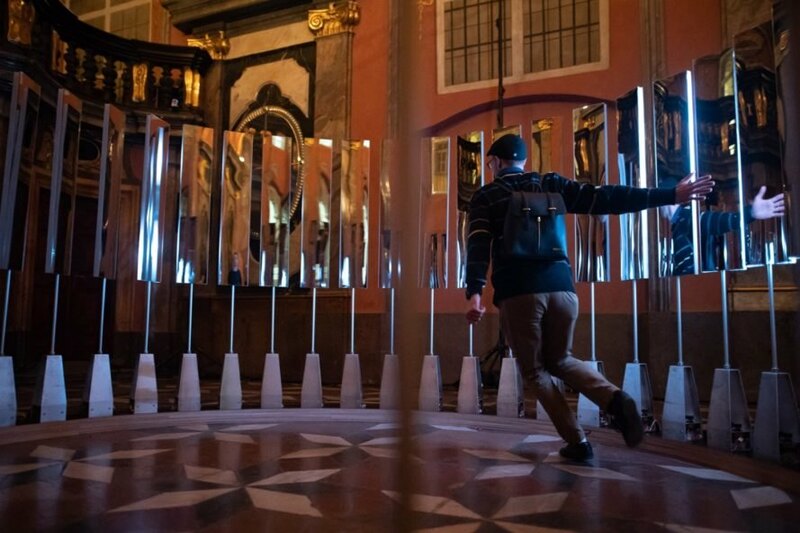 One of the many invited international design practices, SOFTlab crafted a site-specific artwork for Mirror Chapel that takes inspiration from the building’s many mirrored surfaces. Arranged as a circular array, the Iris art installation reacts to sound and movement to create a bewildering display of light and reflections evocative of a ‘mise en abyme’ — a French term describing the technique of putting a copy of an image within itself — that mixes elements of the chapel, viewers and light into a series of recursive and panoramic images. 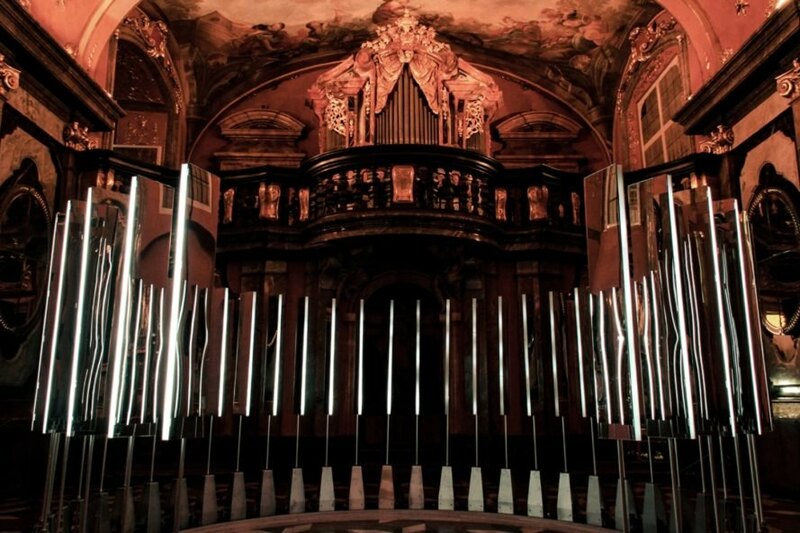 Prague's Mirror Chapel has been adorned with new mirrors. The illuminated mirrors are part of an art installation by SOFTlab. The circle of mirrors create a 'mise en abyme' effect. LED lights brighten the mirrors. As people move, their reflections alter within the circle of mirrors. The psychedelic art installment is part of the Signal Festival of Lights. The art reacts to light and visitors. Guests can experiment with movement and stillness inside the circle. A visitor runs to watch his reflection change. Guests enjoyed the trippy, dream-like experience. The modern installment contrasts with the historic, ornate chapel.